I read a lot of blogs and keep up to date via Google Reader. I found this cartoon this week on Naked Pastor. David, aka Naked Pastor, sums up a lot of my fears in his cartoons. This none in particular hits the nail on the head of what, to me, is wrong with a lot of what we call church. 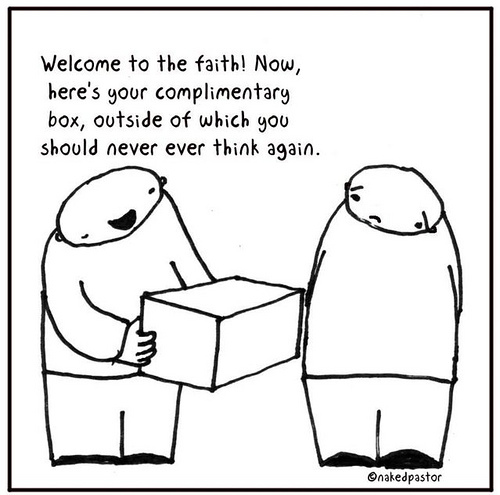 A number of people I seem to engage with during the week seem to have this image of church – an image where thinking is controlled. I don’t wish to be part of something which aims to control how we think or what we believe. I want to be part of something that explores together and learns from each other as we journey with each other. This entry was posted in church by robryan65. Bookmark the permalink.